Sevan Matossian's Behind the Games continues to show you the other side of the story from the Home Depot Center in Carson, Calif. This third installment covers the last day of the competition as the field is narrowed and the competitors are put through the final secret workouts that will help determine the world's fittest athletes. Follow Matossian deep into the Cone of Silence where the athletes were secluded before walking onto the HDC floor to discover their last tests. 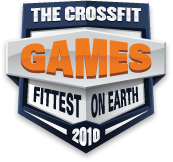 For the live-stream archive of the 2010 CrossFit Games, click here. Watch the entire video in the CrossFit Journal. 19 September 2011 / 1:50 a.m.